Wired’s Danger Room is reporting on a new DARPA project to build brain implant chips that will fix brain injuries. The focus appears to have come from the large number of returning veterans who suffer from brain injuries. However the implications of this type of research go far beyond simple repair. As science improves the current state of the art of brain implants (which now offer only rudimentary connections to actual brain functions), we are likely to see a spectacular increase in human intellectual capabilities. Our current limitations to information processing include the very slow speeds with which we can interact with computers – usually via keyboards. When implants will allow brains to *directly* interface with, for example, internet information, we are very likely to experience an explosion of human capabilities. This was an impressive but simple demo of an amazing technological achievement. 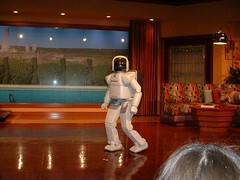 The locomotion was very realistic and impressive as ASIMO walked around and went up and down some stairs. I fear a lot of young folks get jaded to how cool this stuff is by the wonders of “entertainment” technologies, but I couldn’t help but think that this Robot will *some day* be used to mark the beginning of when human-like robotics really took hold of the collective mindset.